Considering moving abroad and living as an extradite? Consider the following destinations that were chosen by the Telegraph as the happiest places to in. 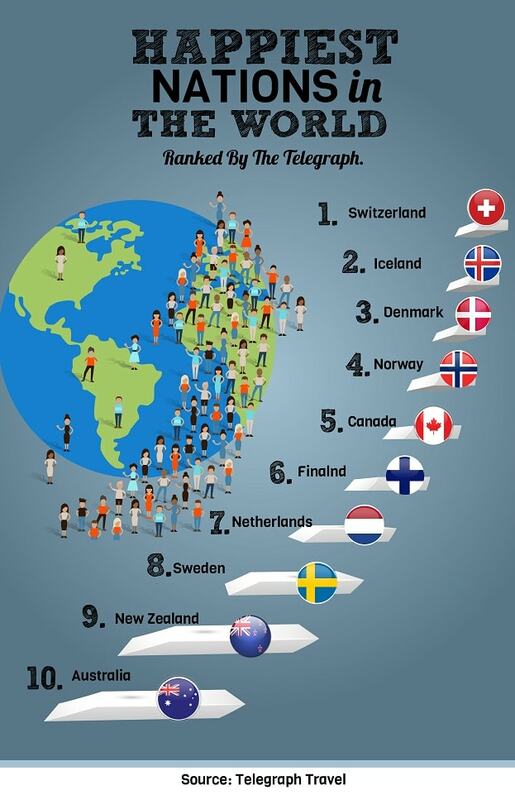 This infographic is a part of MoneyTransferCompaison Expat Lifestyle Magazine. The World Happiness Report is released annually by the UN Sustainable Development Solutions Network. Below are the 10 happiest countries to live in, but why are people so happy there? And are there disadvantages to living in them? 2. High cost of living and difficult (for expats) job market. Difficult to naturalize. Tip: Send money to Canada, Australia, Switzerland or any other country from the list using our moving money abroad guide. Looking to learn more about non-recommended countries where inequality is greatest? read this. Learn about the psychological risk of relocating abroad. Looking to study in either of these countries? View our Studying Abroad Guide. Looking to move to the USA even though it doesn’t appear on this list? View our US Visa Form Filling Guide.